When Apple’s iPhone hit the market, it looked like it was only a matter of time before Apple ate BlackBerry maker RIM’s lunch. 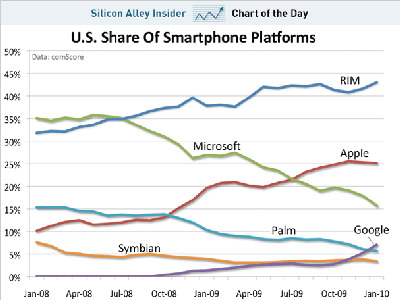 While that could still be case, RIM has done a great job defending its turf to this point. The newest data from comScore’s mobile subscriber report shows RIM’s slow but steady ascent over the past two years as the U.S. smartphone leader. Note that comScore data is based on user surveys, and reflects subscriber base — not simply market share of a specific quarter’s sales. How is RIM doing it? It started by being very popular with businesses, and it gradually shifted its focus to consumers. Verizon, the top U.S. carrier, has been promoting the heck out of it, including several buy-one, get-one promotions. And generally lower prices have made the BlackBerry Curve and Pearl very popular phones among mobile Web users and also people who just want a phone that’s good for text messaging. While RIM has performed admirably to date, there are challenges ahead. For instance, it’s hard to see BlackBerry hanging on to such a strong lead for the next five years, unless it can improve its mobile software — especially the Web browser — and start competing better with Apple and Google in the mobile apps arena. (Yes, RIM has an app store, but it’s pretty lousy.) 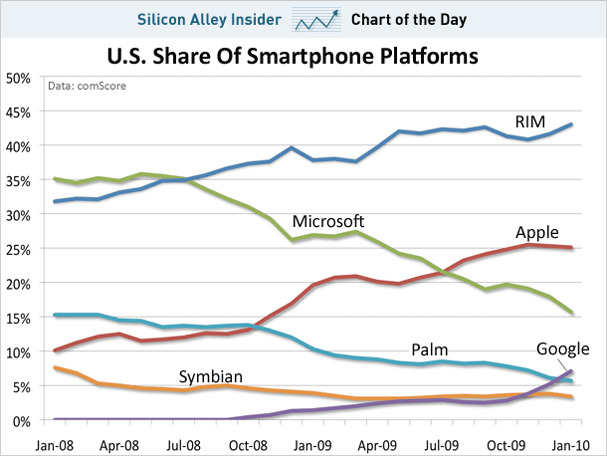 And if Apple starts selling the iPhone at more carriers, that could be more trouble for RIM.